Image: "Magnificat," Â© Jan Richardson. Illustrated (NRSV) Lectionary readings from VanderbiltDivinity Library. Roman Catholic Lectionary Readings from the NewAmerican Bible. Preaching This Week commentary, WorkingPreacher.org, Luther Seminary 2,017, 2014.2011. 2008. "Witness under Fire," D Mark Davis, Left Behind and Loving It, 2017. 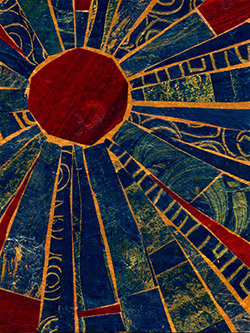 Disclosing New Worlds, Advent 3B, commentary and reflections, Lawrence Moore, 2014. "Shout with Joy," Kathryn Mathews Huey, UCC, SAMUEL, 2017. Starters for Sunday, 14 December, 2017. Thoughts on Readings, Prayers & Hymn Suggestions. Office for Worship, Doctrine and Artistic Matters, Church of Scotland. The Lectionary Lab, Advent 3B, the Rev'ds Dr. John Fairless and Delmer Chilton (aka "Two Bubbas and a Bible"), 2011. Jesus Now, Advent 3B, lectionary, study and worship resources from Faith Futures Jesus Then & Now. Rumors, for December 14, 2008, Ralph Milton, "Sermon helps for preachers with a sense of humor." Sermon Brainwave, Lectionary podcast featuring Profs. Rolf Jacobson, Karoline Lewis, Matt Skinner, discussing the week's passages in light of current events. At Luther Seminary's WorkingPreacher.org. 2017. Living by the Word, Martha Spong, The Christian Century, 2017. "Witnessing," Karoline Lewis, Dear Working Preacher, 2017. "With All My Soul," Todd Weir, 2017. "The Darkness," Andrew Prior, 2017. "Bearing the Light," Jan Richardson, The Advent Door, 2017. "Who Do You ThinkYou Are?" Glenn Monson, Law & Gospel Everywhere, 2017. "The Voice in the Wilderness," Nancy Rockwell, The Bite in the Apple, 2017. "Proclaiming Liberty to the Captives: #Metoo," Janet H Hunt, Dancing with the Word, 2017. "The Light of Christ," Kelley Land, Next Sunday Resources, Connections, 2017. Poetry from Prison, Advent Freedom, Liz Milner, Journey with Jesus, 2017. ON Scripture, Odyssey Networks, 2014. Video. Revised Common Lectionary commentary and discussion, RevGalBlogPals, 2014. Question the Text, Russell Rathbun and friends, 2014. Bob Cornwall, Ponderings on a Faith Journey, 2014. Sharron R. Blezard, Stewardship of Life, 2014. 2011. Bob Stuhlmann, Stories from a Priestly Life, 2014. Lectionary Notes for Advent 3, Beth Quick, 2014. Steve Godfrey, Church in the World, 2014. "Surprised by Joy," Steve Goodier, Life Support System, 2014. "John, Jesus, and the Alpha Male," David Lose, Dear Working Preacher, 2011. "Faith and Fear," Thomas Long, ON Scripture, 2011. "Are You the Revolutionary?" Caspar Green, Scarlet Letter Bible, 2011. "Tears of Despair, Dreams of Laughter," The Journey with Jesus: Notes to Myself, Daniel B. Clendenin, Journey with Jesus Foundation, 2011. 2008. "Ruins, Beautiful and Sad," "ain't highfalutin," Fr. Rick Morley, a garden path, 2011. "The Church as Highway Department," Ragan Sutterfield, The Ekklesia Project, 2011. "Testify to the Light," Suzanne Guthrie, Soulwork toward Sunday: At the Edge of the Enclosure, 2011. "The Scandal of the Incarnation," Debra Dean Murphy, Intersections, 2011. "Jesus the untouchable deal breaker," Peter Woods, I Am Listening, 2011. This Sunday's Readings, (Advent 3B), Rosalind Brown, Church Times, (Church of England), 2011. Daily Reflection, Advent 3B, 2011, Larry Gillick, S.J., Creighton University, 2011. Reflexiones Dominicales en español. Advent 3: The Prayer Book of John the Baptist, Jan Richardson, The Advent Door, 2011. Use of images. "It's Not About Us," John van de Laar, Sacredise, 2011. "Time to Lighten Up," Sharron R. Blezard, Stewardship of Life, ELCA, 2011. Lectionary Ruminations, Summit to Shore, 2011. "Just Breathe," Miriam's Tambourine, Memphis Theological Seminary, 2011. "Turn on the Light!" Bob Cornwall, Ponderings on a Faith Journey, 2011. Sermon Notes for December 11, Michael Rich, In-Formatio, 2011. "Hidden in Plain Sight," Alyce M. McKenzie, Edgy Exegesis, Patheos, 2011. "God Returning," John C. Holbert, Patheos, 2011. "The Practice of Hope," David Henson, Patheos, 2011. "Thunder in the Desert," Neil Chappell, a weird thing, 2011. "Joy?" Melissa Bane Sevier, Contemplative Viewfinder, 2011. Grounded & Rooted in Love, Advent 3B, Matt & Laura Norvell, 2011. "Am I Not Entering Holy Ground?" Larry Patten, 2011. Dylan's Lectionary Blog, Advent 3B. Biblical Scholar Sarah Dylan Breuer looks at readings for the coming Sunday in the lectionary of the Episcopal Church, 2005. "Hope as Radical Protest," Richard Bower, Proclaiming Gospel Justice: Reflections on the Scriptures and Progressive Spirituality, The Witness, 2005. "The Third Sunday of Advent," Abbot Gueranger O.S.B. "Standing on Promises," Kathleen Norris, 2005. "Messianic Complex," John Stendahl, 2002. "The Sent and the Sender," Delores S. Williams, 1990. "Our Waiting Rooms Speak Volumes," Enuma Okoro, "Bearing the 'Wait' of the World," 2011. "The Gift of Grace," Michaela Bruzzese, "Christmas Presence," 2008. "Proclaiming 'the Year,'" Robert Roth, "The Beauty of Justice," 2005. "The Hard Work of Making Life Right," Michael Brown, Day 1, 2017. "God Has A Dream," by Michael Curry.Â A Sermon for EveryÂ Sunday.Â Video sermons from Americaâ€™s best preachers for everyÂ SundayÂ of the Liturgical Year. "Barth and John the Baptist," by Wallace Adams-Riley.Â A Sermon for EveryÂ Sunday.Â Video sermons from Americaâ€™s best preachers for everyÂ SundayÂ of the Liturgical Year. Sermons that Work, Episcopal Digital Network, 2014. Sermones que Iluminan, Episcopal Digital Network, 2014. "Prayer," Frederick Buechner Sermon Illustrations. Ministry Matters, December 14, 2014. "The Hand of God on the Shoulder of a Troubled World," the Rev. Dr. Kenneth Carter, Day 1, 2011. "God's Will for You," the Rev. Dr. Fred R. Anderson, Day 1, 2008. Shout with Joy, Weekly Seeds, UCC, 2014. Bible Study, Sermons that Work, Episcopal Digital Network. Lectionary Notes, Advent 3B, Rev. Beth Quick and the Lectionary Chat Group Bible Study of St. Paul's UMC, Oneida, NY. "Pray without Ceasing," study guide, Robert B. Kruschwitz, (other resources at) "Prayer," Christian Reflection, The Center for Christian Ethics at Baylor University, 2009. Focus articles: "Pray without Ceasing," "Prayerful Intimacy." "Improving Our Seeing and Listening," study guide, Robert B. Kruschwitz, (other resources at) "Mysticism," Christian Reflection, The Center for Christian Ethics at Baylor University, 2005. Worship Resources, December 11, 2011, Rev Mindi, Rev-o-lution. Mustard Seeds, "Joy," Advent 3, 2011. A lectionary-based ideas resource for leaders of contemporary worship, Ann Scull, Gippsland, Australia. Lectionary Liturgies, Advent 3, Thom M. Shuman, Presbyterian Church (U.S.A.), 2011. Worship and Liturgy Resources, Advent 3 by Rev David Beswick, Uniting Church in Australia. The Timeless Psalms: Psalm 126, (Advent 3B), Joan Stott, prayers and meditations based on lectionary Psalms, 2014. Confession RCL, Bill Wessner, 2011. Prayers of the People, Advent 3B, Rick Morley, 2011. Call to Worship, December 11, 2011, Mary Jane Konings, Timaru, New Zealand. Prayer for Advent 3B, RevGalBlogPals, 2011. Confession, Joanna Harader, Spacious Faith, 2011. HermanoLeón Clipart, Advent 3, Free clipart, backgrounds, slides, etc. Clip Art Images: John 1:6-28, Misioneros Del Sagrado Corazón en el Perú. Advent 3B at Cerezo Barredo's weekly gospel illustration. Follows Latin American Roman Catholic gospel reading, though most gospels texts/themes are found in the index. Liberation emphasis. Clip Art, Advent B3, Fr. Richard Lonsdale, Resources for Catholic Educators. The Role of Hope, Faith Element, 2011. "Bubbles or Gift Box" John Stevens, Dollar Store Children's Sermons, Video, 2014. "Stand Firm," "True Light," Brenton Prigge, NewHymn. Hymns of the Spirit Three, Advent 3B, Richard E. Hurst, Universalist National Memorial Church. Shepherd Sounds, Advent 3B, Background information for hymns and choral music following the lectionary from the Episcopal Church of the Good Shepherd, Austin, Texas, by Eric Mellenbruch and David Zersen. Lectionary Hymns, Advent 3B, National Association of Pastoral Musicians. Choral Anthem Project, Advent 3B, National Association of Pastoral Musicians. Sing for Joy, Advent 3B, 2008. Choral reflections on this week's lectionary readings, St. Olaf College. Worshiping with Children, Advent 3B, Including children in the congregation's worship, using the Revised Common Lectionary, Carolyn C. Brown, 2014. 2011. 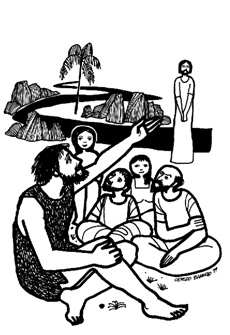 "Storypath Lectionary Links: Connecting Children's Literature with our Faith Story," December 14, 2014, Union Presbyterian Seminary. Connections: Isaiah 61:1-4, 8-11 andIggy Peck, Architect by Andrea Beaty, 1 Thessalonians 5:16-24 and Bedtime is Canceled by Cece Meng, John 1:6-8, 19-28 and Under Alaska's Midnight Sun by Deb Vanasse. 2011. "The Light of the World," Dianne Deming, Children's Sermons Today, 2011. The Black Cave, Janice Scott, The Village Shepherd.